There are varying opinions about the sequence of weaning foods. Most babies are accustomed to a diet composed entirely of milk till the sixth month. 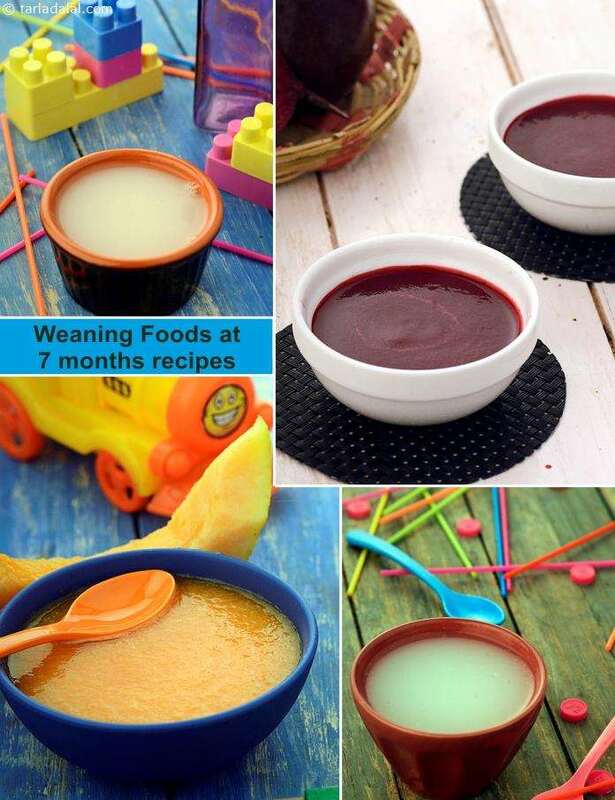 So initially, it is a good idea to introduce weaning with liquid supplements like soups, juices, and dal water starting from the sixth month onwards. These can be followed by semi-solid supplements like mashed cereals, fruits and vegetables. You should begin with one such supplementary feed every day, preferably in the morning. Later, you can add one more feed in the evening. Consult your paediatrician before you start weaning, as he will be the best person to guide you about the special needs of your baby. Dairy Products: In the first month of weaning, top milk (cow's or buffalo's) is not recommend by most paediatricians as you are still breastfeeding and that is enough to fulfil your little one's requirement. But if you are giving mashed fruits like banana, then to thin down the consistency, you can add 2 tbsp of breast milk or cow's milk (as it is more easily digestible) as shown in the recipe of Banana Mash. However, it is advisable to feed just a teaspoon of mashed banana when you are feeding it for the first time to ensure that your baby doesn't have any digestive problems or allergy to cow's milk. Fruit and Vegetable Juices: A well-balanced diet is essential, especially during these initial months. Your little one is growing now and will need vitamins and minerals to make her strong. Fresh fruit and vegetable juices made of carrots, beetroot, apple and muskmelon that are storehouses of vitamins, are the best foods to supplement a breast milk diet. You can also serve Apple Punch, which is strained water of cooked apples. • Straining the juices is necessary to make digestion easier. • Most paediatricians recommend that fruits like custard apple, pineapple, grapes, watermelon, guavas, orange and strawberry should be avoided till your baby is one year old. • It is better to avoid using vegetables like tomatoes to make juice as they may contain some indigestible shreds even after you strain them, and these may be difficult for your baby to digest at this age. • To begin with, introduce your baby to a single fruit or vegetable juice at a time. This will help you to identify your baby's likes, dislikes and allergies, if any. Check the recipe of Carrot Juice, and Muskmelon Juice. • Follow this with a combination of two fruits or vegetables, once the baby has adjusted to both the fruits or vegetables individually. Try Carrot and Muskmelon Juice. • Start with 1 teaspoon of liquid and gradually increase the amount to about half a cup per day. • Before you start preparing your baby's meal, do remember to wash and sterilise all the utensils and equipments you use. • Don’t expect your baby to like all the foods you give her. If she does not like something, avoid it for some days and try again later. • Stay away from myths and superstitions. A prevalent notion that fruit juices must be warmed before feeding to prevent your baby from catching a cold is completely erroneous. Warming or heating will destroy the volatile vitamin C present in them. Vegetable Soups and Dal Water: Strained dal water is the best one to begin with, especially moong dal as it is easier to digest. Serve Moong Dal Water and see your little one’s face light up. You can also begin with thin strained vegetable soups such as carrot, pumpkin, bottle gourd, beetroot etc. These are a good source of Vitamin A and Vitamin C.
• It is advisable to begin with one type of vegetable soup or dal and gradually accustom your baby to a combination of these vegetables and dals. • Try recipes like Masoor Dal Water, Doodhi Soup, Beetroot Soup, and Carrot Soup. Gradually try vegetable combinations like Beetroot and Carrot Soup. • A wide variety of soups and dals will help your baby savour and develop a taste for foods other than breast milk. • Adding salt to babies' meals at this age is not recommended as their kidneys are not yet developed. Don't worry; they don’t have a craving for sugary and salty foods at this age. So, they will definitely welcome the salt-free foods served to them. Babies are most likely to take to semi-solid foods with gusto, savouring this addition to their regular diet of milk, soups and juices. It is also quite possible that they may resist these changes, resulting in a messy meal and splattered clothing and furniture. Do not be alarmed by this as your baby may resist new tastes initially. It is a natural process where she is trying to adapt to new foods and to learn the skill of swallowing foods other than liquids while also adapting to newer flavours. It is not essential to follow a strict drill or order in which to introduce the supplementary foods. However, the best semi-solid supplement for your baby initially, is a single cereal or a mashed fruit or vegetable. Rice is the most common cereal to begin with, as it is nutritious and easiest for babies to digest. It is wiser to begin with Rice Water and within a week or two you can start on Rice Mash. This is the time to introduce mashed fruits as well. Most babies will love the sweet taste of fruits and welcome this innovation in their regular diet. Banana Mash makes an excellent meal. Chickoo, papaya and ripe mango can also be great additions. Ensure that food is properly cooked and blended to a semi-solid consistency so that it is easy to swallow. Remember to begin with a single fruit or vegetable and gradually introduce your baby to combinations. If she does not accept a particular food, do not worry. Wait patiently for 1 or 2 weeks and re-introduce the same food again. In the meanwhile, try other food group combinations instead. Enjoy our healthy toddler recipes for 1 to 3 years and other baby recipes articles below.